Michael F. Goodchild is Emeritus Professor of Geography at the University of California, Santa Barbara, where he also holds the title of Research Professor. Until his retirement in June 2012 he was Jack and Laura Dangermond Professor of Geography, and Director of UCSB’s Center for Spatial Studies. He received his BA degree from Cambridge University in Physics in 1965 and his PhD in geography from McMaster University in 1969, and has received four honorary doctorates. He was elected member of the National Academy of Sciences and Foreign Member of the Royal Society of Canada in 2002, member of the American Academy of Arts and Sciences in 2006, and Foreign Member of the Royal Society and Corresponding Fellow of the British Academy in 2010; and in 2007 he received the Prix Vautrin Lud. He was editor of Geographical Analysis between 1987 and 1990 and editor of the Methods, Models, and Geographic Information Sciences section of the Annals of the Association of American Geographers from 2000 to 2006. He serves on the editorial boards of ten other journals and book series, and has published over 15 books and 500 articles. He was Chair of the National Research Council’s Mapping Science Committee from 1997 to 1999, and of the Advisory Committee on Social, Behavioral, and Economic Sciences of the National Science Foundation from 2008 to 2010. 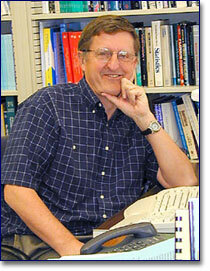 His research interests center on geographic information science, spatial analysis, and uncertainty in geographic data.